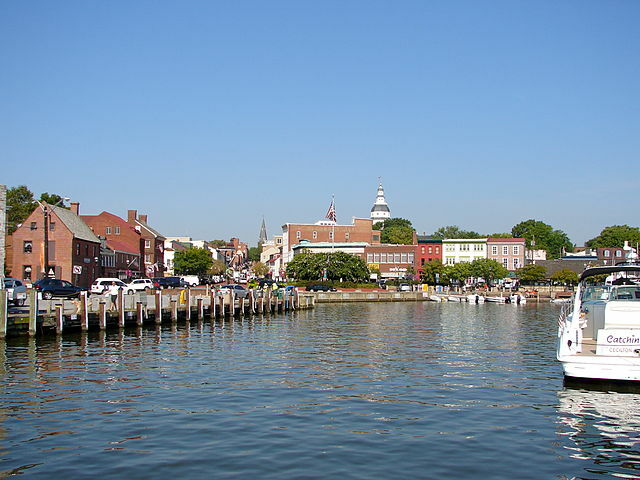 Annapolis is the capital of Maryland, and it is situated at the mouth of the Severn River which flows into the Chesapeake Bay, 26 miles south of Baltimore and about 29 miles east of Washington D.C.
Annapolis is part of the Baltimore-Washington Metropolitan Area. The city was the site of the Annapolis Peace Conference, held in November 2007, at the United States Naval Academy. St. John’s College is also in Annapolis. Annapolis offers a wide variety of activities. It is home to fabulous boat shows. The sports enthusiasts can attend football, baseball, lacrosse and all sorts of other sports year round at the United States Naval Academy. You can also attend our annual Renaissance Festival or our New Years Eve Celebration with hundreds of musical, theater, dance and comedy performances in and around the City. A settlement named Providence was founded on the north shore of the Severn River in 1649 by Puritan exiles from Virginia led by William Stone. The settlers moved to a better-protected harbor on the south shore. The settlement on the south shore was initially named “Town at Proctor’s,” then “Town at the Severn,” and later “Anne Arundel’s Towne” (after the wife of Lord Baltimore who died soon afterwards). The city became very wealthy through the slave trade. In 1694, soon after the overthrow of the Catholic government of the lord proprietor, Sir Francis Nicholson moved the capital of the royal colony there and named the town Annapolis after Princess Anne, soon to be the Queen of Great Britain; it was incorporated as a city in 1708. From the middle of the 18th century until the War of Independence Annapolis was noted for its wealthy and cultivated society. The Maryland Gazette, which became an important weekly journal, was founded there by Jonas Green in 1745; in 1769 a theater was opened; during this period also the commerce was considerable, but declined rapidly after Baltimore, with its deeper harbor, was made a port of entry in 1780. Water trades such as oyster-packing, boat building and sail making became the city’s chief industries. Currently, Annapolis is home to a large number of recreational boats that have largely replaced the seafood industry in the city. 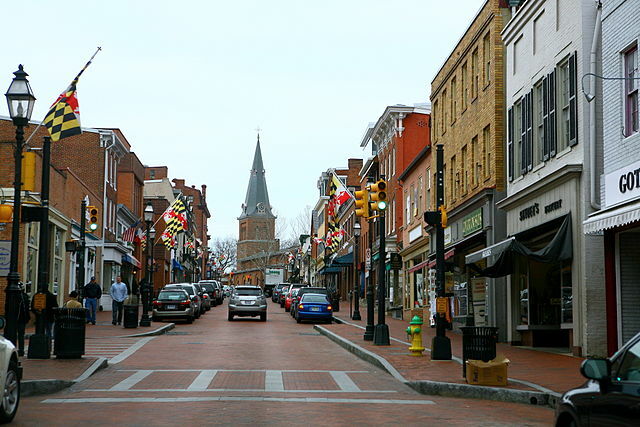 Annapolis became the temporary capital of the United States after the signing of the Treaty of Paris in 1783. Congress was in session in the state house here from November 26, 1783, to June 3, 1784, and it was here on December 23, 1783, that General Washington resigned his commission as commander-in-chief of the Continental Army. 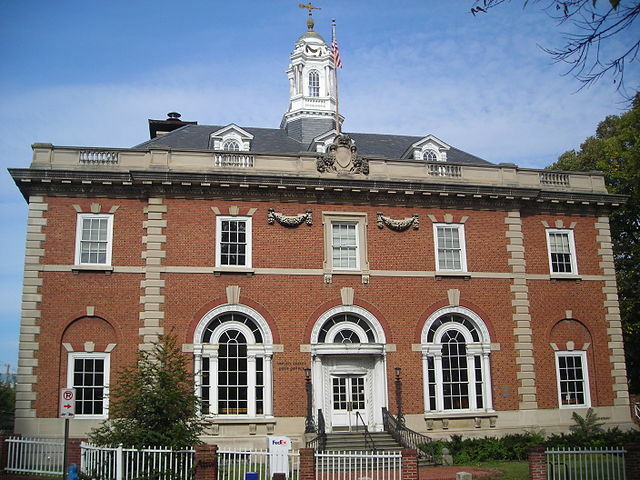 In 1786, a convention, to which delegates from all the states of the Union were invited, was called to meet in Annapolis to consider measures for the better regulation of commerce; but delegates came from only five states (New York, Pennsylvania, Virginia, New Jersey, and Delaware), and the convention, known afterward as the “Annapolis Convention”, without proceeding to the business for which it had met, passed a resolution calling for another convention to meet at Philadelphia in the following year to amend the Articles of Confederation. The Philadelphia convention drafted and approved the Constitution of the United States, which is still in force. During this period, a Parole Camp was set up in Annapolis. As the war continued, the camp expanded to a larger location just outside of the city. The area is still referred to as Parole. Wounded Union soldiers and Confederate prisoners were brought by sea to a major hospital in Annapolis. Close by are the state treasury building, erected late in the 17th century for the House of Delegates; Saint Anne’s Protestant Episcopal church, in later colonial days a state church, a statue of Roger B. Taney (by W.H. Rinehart), and a statue of Baron Johann de Kalb. Annapolis has many 18th century houses. The names of several of the streets,King George’s, Prince George’s, Hanover, and Duke of Gloucester, etc.,date from colonial days. The United States Naval Academy was founded here in 1845. Annapolis is the seat of St. John’s College, a non-sectarian private college that was once supported by the state; it was opened in 1789 as the successor of King William’s School, which was founded by an act of the Maryland legislature in 1696 and was opened in 1701. Its principal building, McDowell Hall, was originally to be the governor’s mansion; although was appropriated to build it in 1742, it was not completed until after the War of Independence. From mid-2007 through December 2008 the city will celebrate the 300th Anniversary of its 1708 Royal Charter, which established democratic self-governance. The many cultural events of this celebration will be organized by Annapolis Charter 300 and will include historical symposia at St. John’s College and evening events such as the Queen Anne’s Ball. The Maryland State House is the oldest in continuous legislative use in the United States. Construction started in 1772, and the Maryland legislature first met there in 1779. 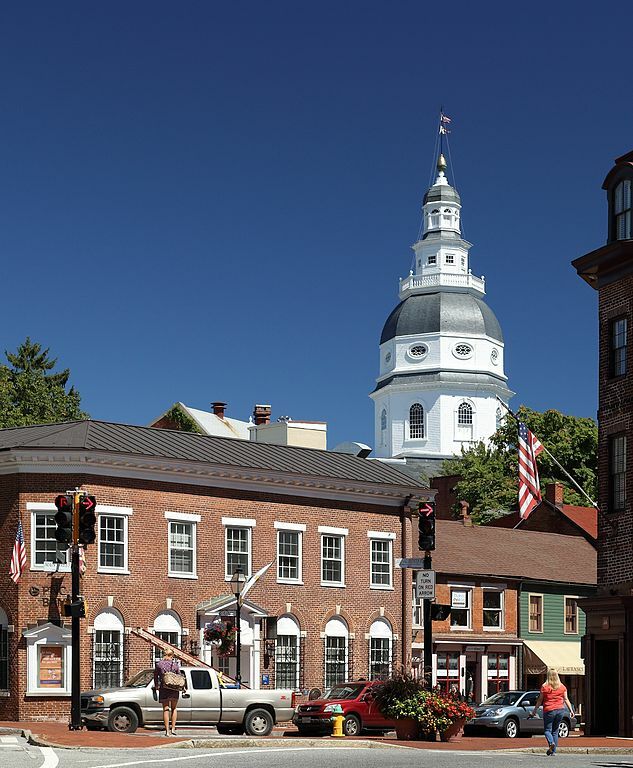 It is topped by the largest wooden dome built without nails in the country.The Maryland state house housed the workings of the government from November 26, 1783 to August 13, 1784, and the Treaty of Paris was ratified there on January 14, 1784, so Annapolis became the first peacetime capital of the US. Annapolis has a thriving community theater scene which includes two venues in the historic district. On East St. is Colonial Players, a company that produces approximately six shows a year on its small theater-in-the-round stage. Colonial Players have ,for the past 28 years produced a musical version of A Christmas Carol, which they commissioned. During the warmer months, Annapolis Summer Garden Theatre presents three shows on its stage, which is visible from the City Dock. All shows put on by King Williams Players, the student theater group at St. John’s College, are free and open to the public. Annapolis is also host to The Bay Theater Company, a non-profit professional drama group. The Naval Academy Masqueraders put on several productions annually in Mahan Hall. The Banneker-Douglass Museum, located in the historic Mount Moriah Church at 87 Franklin Street, documents the history of African Americans in Maryland. Museum offers free admission, educational programs, rotating exhibits, and a research facility.